When you go to a shop or restaurant in Japan, even if you’ve learnt you basics of Japanese, it can be hard to understand what the shop assistance are saying. Not only are they saying sentences they’ve been saying all day everyday which makes them more like automated lines, but they also use a mutated form of Japanese they you would not have learnt in lessons. 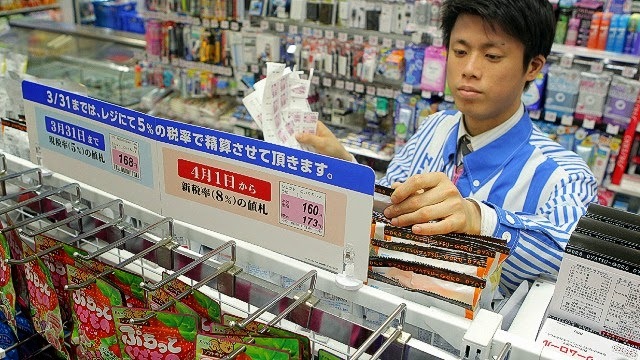 Even if you’re learning up to JLPT N1 level “shop speak” isn’t a topic that’s normally covered in conventional lessons. This is because normally to be polite Japanese people will use keigo. Keigo tends to be quite long and the longer it is the more formal it is, such as “can you give me a cake”, instead of 「ケーキくれない？」(which is a friendly informal way of talking) in keigo it would be 「ケーキをいただけないでしょうか？」. This is all very good when working in an office environment and dealing with professional guests, but when you’re working in a store and saying the same things over, and over, and over, the longer keigo becomes a bit of a mouthful. So in the early 00s baito-keigo or konbini-keigo (バイト敬語 / コンビに敬語) formed as a commonly used polite way to saying things without them being too long. There are also booked called manual-keigo (マニュアル敬語) which are manuals given to people looking for part-time work so they can learn this baito-keigo. Not only that but a lot of Japanese people don’t know the correct way to use keigo and so the keigo used in shops is often not correct (so don’t copy them thinking it is). 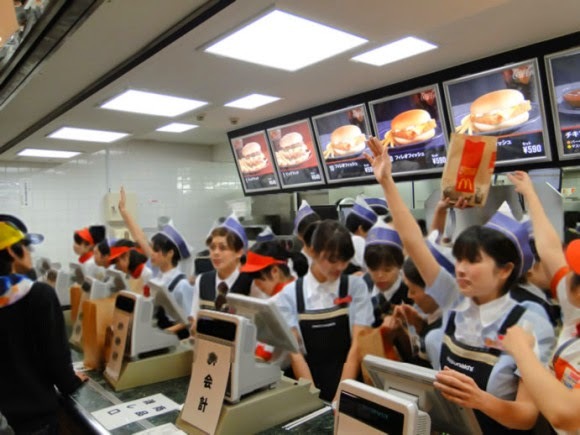 Many of these phrases, as suggested, are used in convenience stores, but have also been picked up by other shops and services like fast food places. This is a guide to understanding what shop assistance say, why they say it, and what’s “wrong” with their Japanese to help you remember (and because it’s interesting). Set phrases are in bold with the baito-keigo underlined. This is used pretty much where ever you go. いらしゃいませ is a set phrase for “welcome” and どうぞ is an inviting word similar to “please come in” in English. These are actually a shorter way of saying 「ごらんになってください」 which is sonkeigo (respectful Japanese) for “please look”. This is where some the baito-keigo comes in, because although you can make non-polite words into polite words using お or ご (such as おきゃく “customer”), つぎ is not one that should be used in that way because it’s honouring the “next” part of sentence. The total is 800 yen please. If you saw the video above from Nihonjin no Shiranai Nihongo and/or know any keigo, you would know that a basic sentence would be 800えんでございます and ございます is the formal use of です. But in バイトけいご this changes to になります. なります is used a lot in baito-keigo as a substitute for でございます, this is wrong because it implies that “something becomes something else” when actually it’s just the shop assistant or waitress handing you an item (money or food) which is you. I suppose it’s implying that “this has now become yours” but it’s still grammatically incorrect. You have given me a 1000 yen bill. This is to confirm what you’ve given them in case you miscounted or they give the wrong change (which is unlikely because they have machines that work out the change). あずかります means “I will take care of this for you”. When it’s turned into respectful keigo it become おあずかりします, but this is still not the correct use of the word as it implied the cashier will return all of your money to you. If you were using the correct kegio and not baito-keigo it would be １０００えんをいただきます or １０００えんをちょうだいいたします. から is also sometimes used, which in a normal sentence wouldn’t make sense because it implies you are taking care of it for the 1000 yen and not you. This is said when you’ve given the exact change, ちょうど meaning “just right”. Instead of おつりでございます it is changed to either になります, します or plain です. Shall I warm that up for you? Shall I wrap it up for you? I got caught out on this one the first time I went to Japan so I’m adding it in. In some shops they might ask you if you would like it gift wrapped (this can be free). つつみます means “to wrap” so in keigo it will be おつつみします. This is an amusing one a friend recently pointed out to me. When you ask a shop assistant or hotel staff a question they might reply with あのですね to give themselves some time to think. What’s amusing about this is that あの means “um” and ね implies “isn’t it?” so “um isn’t it” doesn’t really make sense. What’s more amusing is the added です makes the sentence more polite. So this is just a very polite way of saying “um”. Literally “I have made you wait” or “you are the person/people who have waited” and implying the “sorry” part. This is said even if you’ve just sat down not 2 seconds ago. Have you decided on your order? This also means “have you decided on your order?” but means “have you completed your order” (implying the “have you decided” part). The thing that’s wrong with this sentence is that よかった sounds very harsh and what would normally be used in polite situations is よろしいでしょうか. Again, as mentioned in the video above, ほう is used to describe areas or something being better, and wouldn’t normally be used in this situation. This is the A lunch. The person who ordered the hamburger. What wrong, and amusing, about this sentence, is that although grammatically correct it means “the customer who is a hamburger” rather than “the customer who ordered the hamburger”. It should be ハムバーガーをちゅうもんしたおきゃくさま, but in this situation the “who ordered” part is dropped. 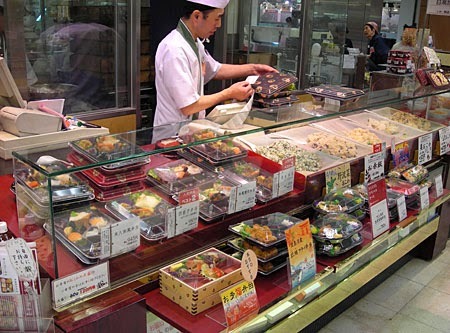 For more on going to restaurants in Japan and ordering food, see this post on Restaurant Japanese. And here’s a fun song about Japanese konbini! Because why not? Click here if you’d like to see the full Japanese and English lyrics side by side with annotations. Feel free to ask questions if you have any. Or perhaps you’ve had your own incidences where you haven’t understood a shop assistant or waitress? Tagged Keigo, Shop Japanese, Visiting Japan.